David Cronenberg is an acclaimed Canadian horror film director. In slang, a cronenberg is a grotesque, often mutilated being that resembles something from one of his movies; to cronenberg something is to mutate it into such a being. I've just been reading about the role of viruses in evolution and the last thing I'd want is people altering my DNA for profit. Everyone would end up Cronenberged. Coming from a small and sceneless town, I’ve experienced firsthand the horror of a primordial music scene oozing out of an extremely shallow pool of talent, and it’s a horrific, Cronenbergesque sight. I’m a huge David Cronenberg fan, and I always viewed Fantastic Four and the kind of weirdness that happens to these characters and how they’re transformed to really fall in line more with a Cronenberg-ian science fiction tale of something horrible happening to your body and [it] transforming out of control. Where does Cronenberg come from? 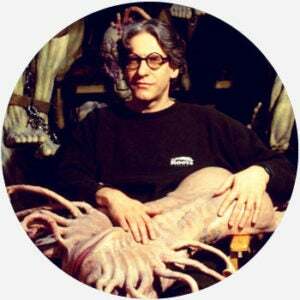 David Cronenberg first garnered some attention in the Canadian arts and film press with art house movies in the early 1970s, but he gained more widespread notice with his sci-fi horror film Shivers in 1975. Cronenberg is best known for directing 1986’s The Fly and the 2005 crime thriller A History of Violence, which was nominated for the prestigious Palme d’Or at the Cannes Film Festival. Cronenberg‘s films are very surrealistic, often featuring the violation and mutilation of the body. This style is often referred to as body-horror, but, thanks to the director’s influence, is now sometimes described as Cronenbergian or Cronenberg-esque. In 1983, a book on Cronenberg‘s work from the Academy of Canadian Cinema described the world of his film Videodrome as Cronenbergian. The same year Newsweek described Videodrome as Cronenberg-esque. The animated TV show Rick and Morty introduced another use of Cronenberg. In a 2015 episode, Rick creates a serum that turns people into twisted blobs of flesh, similar to things you may see in a Cronenberg film. Rick refers to the creatures as Cronenbergs, saying that they’ve been Cronenberged. Cronenbergian and Cronenberg-esque were first used to describe Cronenberg‘s own films but later expanded to encompass movies that resemble his own. The terms may also be used more generally to describe anything which evokes the types of horrors seen in Cronenberg movies, such as bodily mutilation, deformity, or mutation. A classic example of Cronenbergian horror is how Seth Brundle (Jeff Goldblum) in The Fly, slowly morphs into a human-fly hybrid, sloughing off pieces of flesh in the process. Cronenberg can also be applied to real items and events, as when the Discover Magazine blogger Neuroskeptic called a rat with a second head transplanted onto it a “Cronenbergesque creature.” Cronenberg‘s name can also be invoked in jest. The Onion AV Club, for example, referred to a movie poster in which an actress’s neck seemed unnaturally elongated as Cronenbergian. The use of Cronenberg to mean a “hideous creature” and Cronenberged to mean “mutated” spread online following the Rick and Morty episode. Starting out primarily as a knowing cultural reference to the director and in-joke among fans of the show, the slang cronenberg has extended to describe similar creatures and events in other shows or hypothetical real-world examples.